After months of waiting, the Houston Rockets finally have their man. No, not Carmelo Anthony. At least not yet anyway. Promising big man Clint Capela has resigned with the team, putting pen to paper on a five-year deal. 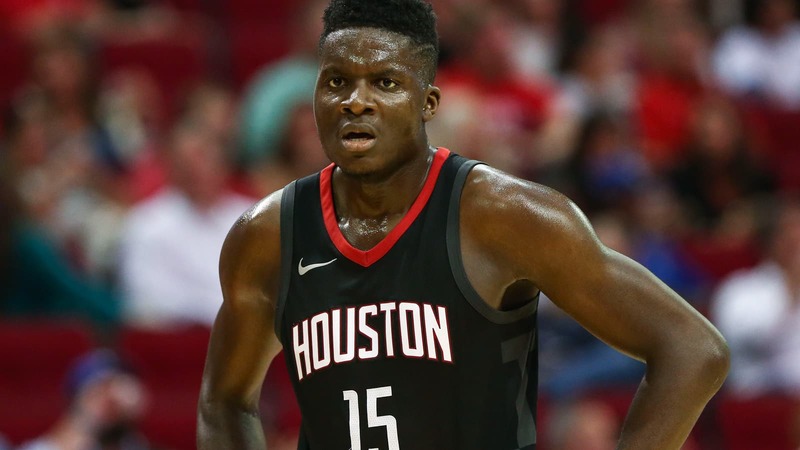 According to ESPN’s Adrian Wojnarowski, the 24-year-old is set to earn $90million over the course of the contract – a significant price tag but one that is justifiable given Capela’s role within the team. Woj’s direct rival, Yahoo’s Shams Charania, broke down the contract further and highlighted that only $80million is fully guaranteed with the remaining $10million made up on incentives. It wouldn’t be surprising if the incentives involved Capela winning Defensive Player of the Year, being named to the NBA All-Defensive team or leading the league in blocks per game. He was huge for the Rockets last season as he anchored their improving defence. Capela averaged 1.9 blocks per game, good for second in the league behind five-time All-Star Anthony Davis, who somehow averaged 2.6 blocks per game. He also grabbed 10.8 rebounds per game while also being a crucial part of the Rockets offence, finishing around the rim with a host of dunks and tip-ins. With the 25th pick in the 2014 NBA Draft, the Rockets came away with an absolute steal. Capela’s combination with both James Harden and Chris Paul is one of the many attacking threats opposing teams need to deal with on a nightly basis. While many might argue that Capela’s job is fairly straightforward – just run, dunk and rebound – it can be said that Houston tried the same thing with Dwight Howard. Ultimately, Howard’s ego and desire to play a bigger role on offence would get in the way, and this is why Capela is the perfect fit for the Rockets. While the $90million might be a big price tag, securing the big man’s services during the prime of his career will be critical for Mike D’Antoni’s team if they’re to compete with the new-look Warriors. The Rockets took Steph Curry and co. to seven games last year in the Western Conference Finals, but with the addition of DeMarcus Cousins, the mountain has become even harder to climb. The Rockets will still need help on the defensive end of the floor, even with Capela in tow. Carmelo Anthony is expected to sign with the team prior to the start of the season but has been vocal in regards to the role that he wants. Should the 34-year-old start alongside Harden, opponents could have a field day exposing them and Capela can only cover up so many defensive lapses. This will also likely lead to the Swiss big man getting into foul trouble which will cause serious issues for the Rockets on both sides of the ball. If the three-point shot isn’t falling, Capela’s ability to finish inside is immeasurable. With Harden, Paul and Capela all on the floor, the Rockets maintained a 42-3 record throughout the regular season. Whether that translates to wins in the 2018/19 season is yet to be determined. But now boasting a “Big Three” of their own, plus potentially Carmelo Anthony, the Rockets could once again be serious contenders to the Golden State title.